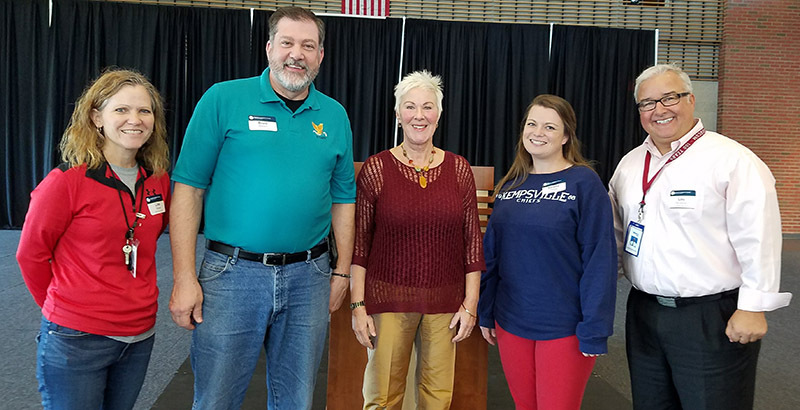 Hampton Roads’ high school guidance counselors took a crash course in TCC at an information session on Nov. 3 at the Chesapeake Campus Student Center. Area high school guidance counselors gathered to learn more about TCC. Shown here, Lisa Weber, Norfolk Technical Center; Brad Markin, Hickory High; President Kolovani; Keisha Phillips; Kempsville High; and Louis DiCioccio, Norcom High. Hampton Roads’ high school guidance counselors took a crash course in Tidewater Community College A-Z at an information session designed especially for them on Nov. 3 at the Chesapeake Campus Student Center. Counselors from Portsmouth, Chesapeake, Norfolk, Suffolk and Virginia Beach learned about the plethora of TCC’s transfer and career programs and its new STEM Promise scholarship for high-achieving students who want to explore a future in science, technology, engineering and mathematics. Faculty and administrators also presented short talks on financial aid, placement testing, guided pathways, transfer agreements and all additional student resources at TCC. TCC has career advisors in each of the public high schools in South Hampton Roads who offer one-on-one college advice, give help completing the TCC application, answer questions about admissions and provide assistance in developing a career plan.